Submittable enables organizations to open completed additional forms for editing if submitters need to make any changes to an additional form. 1. Find the submission in your Submissions List and click on the title to open the Submission Details page. Note: Submissions that have additional forms attached to them will show an additional form icon to the right of the Submission title. 2. At the top of the Submission Details page you will see a list of any additional forms that are attached to the submission. Completed additional forms will have an Open Editing button to the right of the title. Click this button. 3. A dialog box (see below) will open. 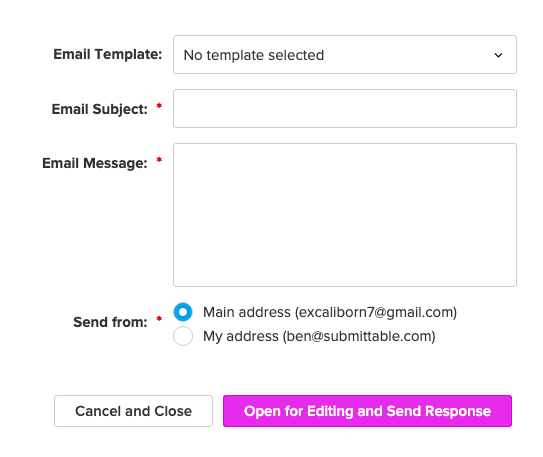 Make the appropriate selection for an email template, and fill in the email subject and message. Select the address you want the notification to come from. 4. Click Open for editing and Send Response. Note: You can also open additional forms for editing directly from the Submissions List page. To open an additional form from here, click on Forms > Additional Forms. Select the additional form you are looking for in the list and click on the link that indicates the number of times the additional form has been sent. Select the completed form you want to open for editing and click on the Open Editing link to the right. Complete the necessary fields in the dialog box (steps 3 and 4 above) then click Open for Editing and Send Response.